This is part 1 of my explorations of using deep learning for assisting the process of music composition. 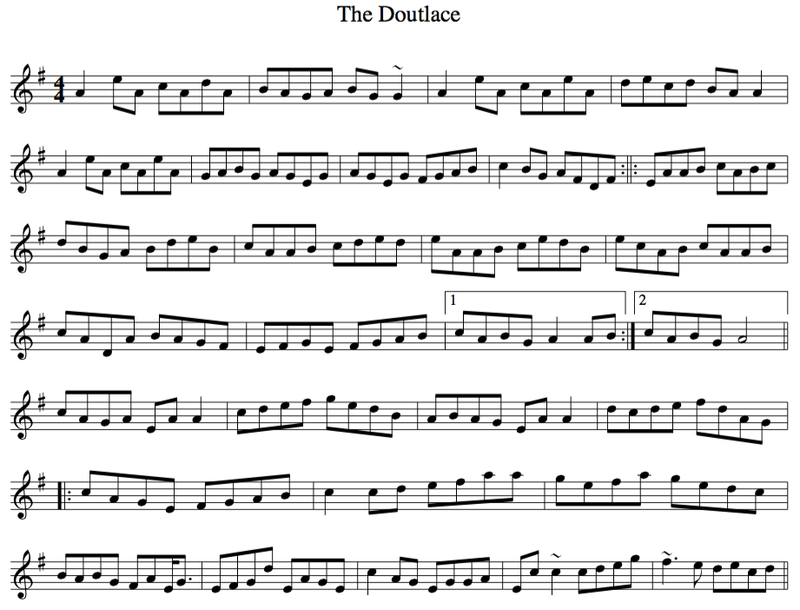 In this part, I look at some almost-winning output of a model trained by deep learning methods on over 23,000 folk tunes, and make improvements to produce a session-ready piece. These are exciting contributions to the well-studied domain of algorithmic music composition. The prospect of developing a system that can learn to emulate characteristics of a collection of music data is one of the aims of “music metacreation“. Thus far, the most convincing demonstrations of music style emulation in my opinion are the EMI system of David Cope, and Continuator of François Pachet. Historically, the Illiac Suite for String Quartet (1956) is a monumental piece in this direction, but of an approach based on expert knowledge rather than learning from a corpus of exemplary music. In The Infinite Irish Trad Session, we have used a recurrent neural network with long short-term memory to build a model from 23,962 traditional Irish tunes (well, a large number of the tunes are Irish). We then sample from that model to generate a new tune, and have our performance system realise it in a way imitating a real Irish trad session. So far, we have produced over 32,000 recordings, which amounts to 491 hours of audio (and a surprised administrator asking why my home directory has ballooned to over 80 GB). From this collection, a system randomly selects every 5 minutes seven recordings and then serves it as a set. To see all of the MP3 we have produced so far, look here. After spending several hours listening to these sets (with my wife feigning incredible enthusiasm, but also surprise at how good the results can sound! Thanks honey!! ), it is clear that the model learned does encapsulate important characteristics of the music style. Many of the pieces have an Irish feel, and I am surprised how many are close to being ready for a session. Here is it converted to staff notation, with the audio of its realisation by our performance system. I think this is a promising tune (it is a kind of “reel” since it is in 4/4). The system has produced two sensible melodies of 8 measures, each one repeated. 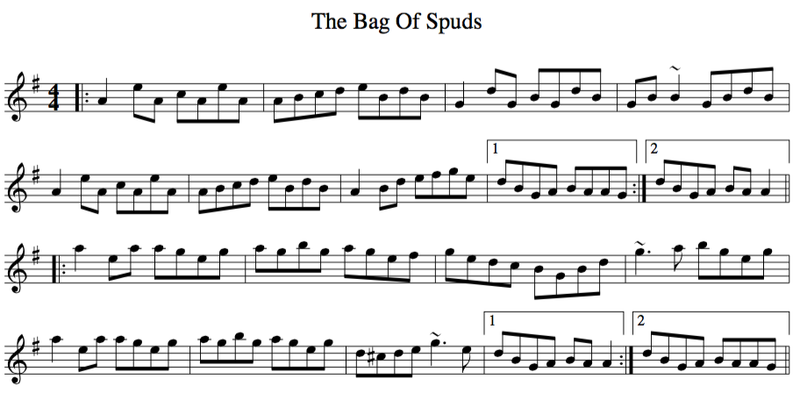 (A “standard” Irish tune is two 8-bar sections, each repeated.) The first melody (the A section, or “tune”) has a nice little figure appearing in the first measure, which returns in the 3rd and 5th measures, but varied with the D raised to an E. The second melody (the B section, or “turn”) has its own little figure, which is repeated and varied. The contours of the two melodies are good. The melody of the B section spends more of its time in the higher notes than that of the A section, which is also typical. The intervals in the cadence in the fourth measure of the tune provides contrary motion to the cadence at the end of the turn. The A tone dominates throughout both sections and makes the tune and the turn sound like they belong together. The last section is odd, however, and doesn’t really fit. It feels as if the model has begun a second piece that it doesn’t finish. and that’s it! These five reels are not all that similar to each other, even though the same figure appears in all. So, it seems that if our system has been copying its learning materials, it is not so easy to detect. In the next parts, I will be taking a look at the “failures” of the model, and the opportunities they bring. UPDATE: Here I am playing the piece. This entry was posted in Machine Learning, Music. Bookmark the permalink. How do you check to make sure that the result is unique ? Do you have a database of songs and compare with each one, or how you do it ? Thank you. That is very kind. For now, we are not checking everything for uniqueness. Initially, I was suspicious because the results were too good; but of those that I checked (in the data we culled from The Session, and without considering transpositions), they seem to be unique. Around 2007 there was a burst of activity from folks developing computer programs to write Irish trad tunes based on the Session (and other) archives. I did one in Lisp that produced some decent output. It was discussed somewhere online, but I can’t remember where at this point. I don’t see it at The Session. (Some boring chord progressions there!) I’d be interested to hear your assessment. I will look for the 2007 activity. Thanks for the info! Thanks for your analysis and running it through your system, the results are interesting! One thing my system does is pattern its new compositions off of existing ones. In this case, the model composition was “Rolling in the Ryegrass” which (at least in its simple iconic version) has 4 bar parts. It was also trying in this tune to have the same “answer” in both halves of the tune and create the kind of tune that begs for a repeat (e.g., Out on the Ocean). (As you say, a real musician would write some kind of resolution for the last repeat!) Another thing you can notice in this tune is the sequence “FDFG ABFA | FDFG BGAB | FDFG ABFA” in the turn where the program has picked up on a motif in trad music of writing “A B | A C | A B” where B & C have some sort of musical relationship. My program was specifically looking for some of those things. It’s interesting to see how much of that structure deep learning can pick up without any specific priming. I see: https://thesession.org/tunes/87 That is a short tune and turn! Thanks for the link! I find the field of intellectual property fascinating. With the recent ruling against “Blurred Lines”, we need to create all possible “feels” separate from melodies. Bob, Maybe music composition is something that is not deep learnable. As I understand it, deep learning is an approach that replicates some aspects of human cognition. But here’s the thing: human beings do not easily compose music, at least not good original music. Some people compose one good item of music in their lifetime, and never succeed in composing any more music that is as good as their first hit. Most people are very good at _judging_ the quality of music, and most people living in richer countries have been exposed to hundreds or thousands of items of high quality music over their lifetime. Yet most people have little idea about how to compose new music that is anything more than a weak variant of something they already know. Wow, this is astonishing. I might embark on a similar project. Two questions: Does the RNN ever produce incorrectly formatted output (for example, bars in the wrong places)? And where does the percussion in the audio come from? Thanks Leon. Yes, the RNN can produce “mistakes”, such as the wrong number of notes in a measure, missing repeats, etc. These mistakes also exist in the training data, introduced by humans. The percussion comes from a script I write, and is derived from the RNN output.